Completed in 2005, the College of Health and Human Services facility was built to reflect Western Michigan University’s sustainability plan and emerging LEED® standards. In 2009, the building earned LEED for Existing Buildings (LEED-EB®) Gold certification, making this facility the first higher education building in the United States to achieve a LEED-EB® rating higher than silver. Comprised of a four-story atrium, classroom/laboratory wing and office wing, the atrium is the facility’s focal point. It contains a garden, open stair tower, cafeteria, student lounge, water feature and lockers. 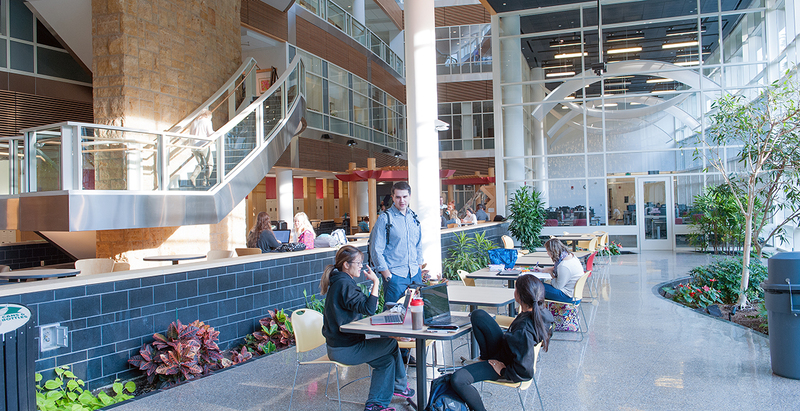 Surrounding the atrium is a technology lab, library, faculty offices and conference rooms. Other unique features include the fourth floor Motion Lab which is cantilevered approximately 12 feet outside the building’s footprint and enclosed by a curtainwall exterior. A beautiful stainless steel encased monumental stair structure in the atrium is built around a Mankato stone clad pier and is visually anchored by an attractive public water feature.